ST. PETERSBURG, Florida -- Baseball and bubble gum have a longstanding relationship, dating back to the days when the stretchy confectionery first appeared in baseball card packs many decades ago. 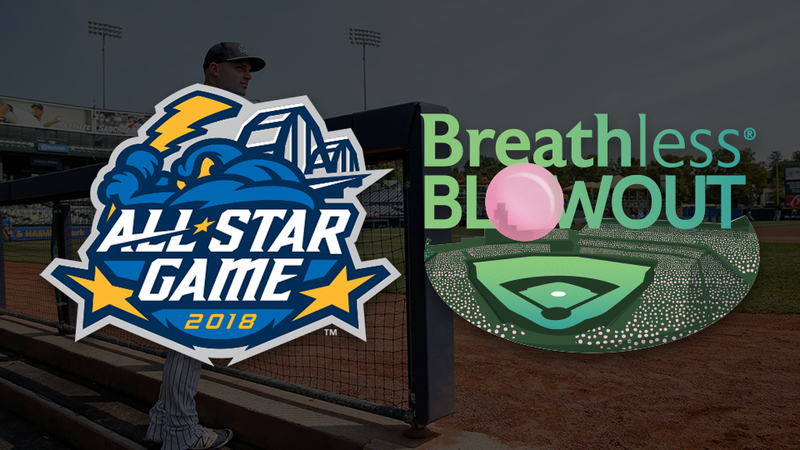 Minor League Baseball™ (MiLB™) today announced that it will use the baseball mainstay to break the GUINNESS WORLD RECORDS™ title for Most people blowing a chewing gum bubble simultaneously. In partnership with Boehringer Ingelheim's Breathless™ campaign, the event is the pinnacle of a season-long "Breathless™ Blowout" campaign that raises awareness for the rare lung disease idiopathic pulmonary fibrosis (IPF). The GUINNESS WORLD RECORDS title attempt will take place July 11 at the 2018 Eastern League All-Star Game in Trenton, New Jersey. ARM & HAMMER Park, home of the Trenton Thunder (Double-A® affiliate of the New York Yankees), will serve as the backdrop as five-time All-Star and IPF spokesperson Bernie Williams directs fans in the challenge. Williams' father, Bernabé, passed away from IPF in 2001. "We are excited to partner with Minor League Baseball and Yankee legend Bernie Williams for our record-breaking Breathless Blowout attempt to pay tribute to all those affected by IPF," said Al Masucci, vice president, IPF Business Unit, Boehringer Ingelheim Pharmaceuticals Inc. "We hope the Breathless Blowout campaign will raise awareness for IPF and help those affected by the disease to recognize their symptoms and get an early and accurate diagnosis." Throughout the 2018 season, 75 "Breathless™ Blowout" gamedays are taking place at 15 MiLB ballparks. Fans will be provided with bubble gum and encouraged to blow bubbles during the games, and will receive information on IPF, its symptoms and treatment. The most common symptoms of IPF include persistent dry cough, shortness of breath, crackling breath sounds and fatigue. Several of these events include an appearance from Williams, where he will share his story and message of hope with fans. According to GUINNESS WORLD RECORDS, the "Most people blowing a chewing gum bubble simultaneously" is 737, and was achieved by lollipop company ChupaChups at Joy Eslava in Madrid, Spain, on Sept. 27, 2014. Last year's Eastern League All-Star Game drew 6,120 fans at Northeast Delta Dental Stadium in Manchester, New Hampshire. "This is a unique opportunity to raise awareness for IPF and its treatment through the great game of baseball," said David Wright, Chief Marketing & Commercial Officer for Minor League Baseball. "The Eastern League All-Star Game will bring together fans who will have the chance to help set a new world record, while also obtaining valuable information and bringing attention to a disease that affects tens of thousands of Americans." Minor League Baseball and Boehringer Ingelheim announced a partnership in March, and are working together throughout this season to educate fans about the symptoms of IPF and the importance of early diagnosis and treatment. The campaign includes stadium events and appearances by Williams, where he will interact with fans and participate in activities like throwing out the first pitch or performing "Take Me Out to The Ball Game" on guitar.